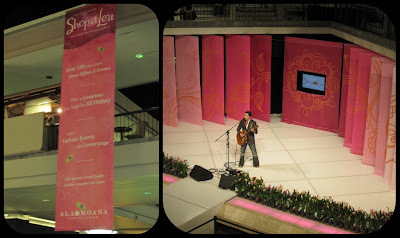 On Friday night I was lucky enough to be invited to "Passport to Luxury", an event at Ala Moana Mall as part of its Shop-a-Le`a celebration. 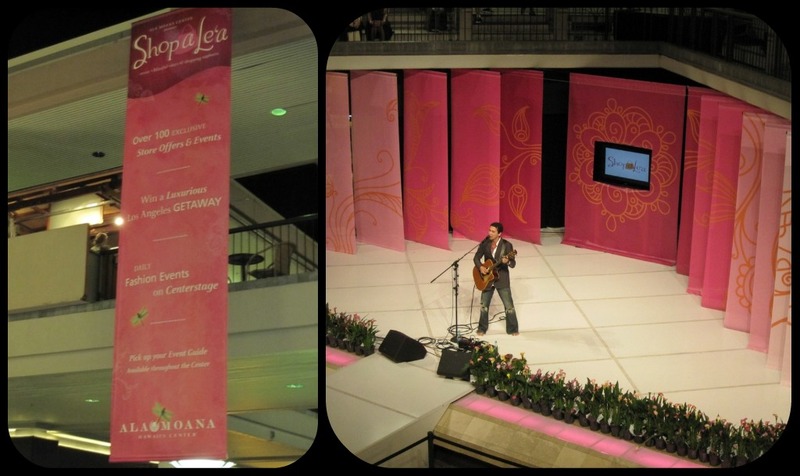 Shop-a-Le`a is (Ala Moana's definition) "Honolulu's premier fashion event. Seven *blissful* days of shopping euphoria. 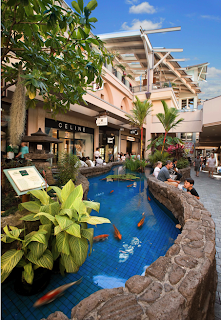 Our 4th annual Shop a Le`a features a weeklong spring shopping and fashion festival. This event presents shopping enthusiasts with more than 150 experiences and offers encompassing fashion, health and beauty, active lifestyle, home decor, travel, music and cuisine". I'd never been to any part of the celebration before this Friday. 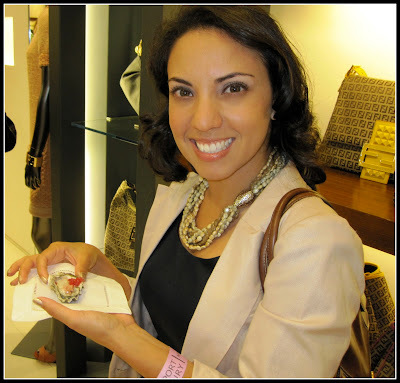 Passport to Luxury encourages you to "STYLE UP! Gather your chicest friends for the ultimate evening of shopping Ala moana center’s luxury boutiques. Enjoy elegant products, special services, delicious bites, premium libations and the Passport shopping experience". We were able to get tickets through work and headed straight from the office to the event. I didn't know much about it, except that we'd be getting free food and drink while being persuaded to buy luxury goods. I meant to leave my wallet in the car in order to avoid temptation, but forgot to! When my coworker Lisette and I arrived, we checked in and got our "passports". Very similar to an actual passport, these had different pages (for traveling to different stores) that you get stamped. They told us which store to go to first: Gucci. Uggggggggggh... if you know about the Gucci bag I once owned, then you know that's a tough subject for me and the store I'd most likely spend my entire paycheck in. If you don't know, don't ask, please! So we quickly went to Gucci, looked around, passed up free champagne, and left to meet up with our other friends. Crisis averted, success! The second store we went to was Fendi, where they were serving oysters and mixed drinks. The mixed drink was unique and refreshing, just what you need at 6 pm on a Friday! Now the oysters, that's totally different. I've eaten one before, on vacation in Florida, only to please my Dad. He insisted that I eat one with him, so I doused it in salt, pepper, lemon juice, hot sauce, and anything else I could find, and threw it back. I never tasted a thing and he was happy, success! Perhaps another oyster will enter my body someday, Friday was not the day. 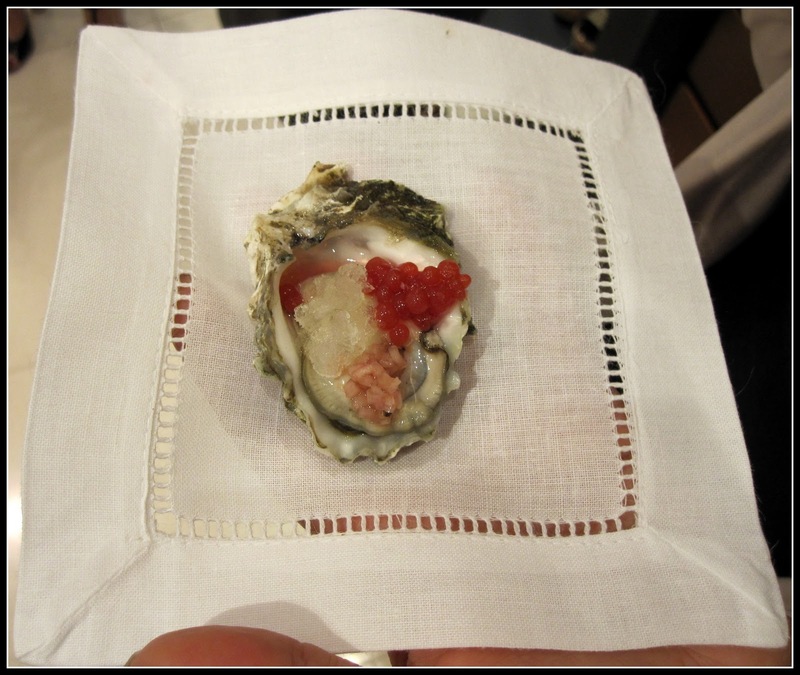 Lisette likes oysters and gladly took one, along with a fancy cloth napkin. It was very pretty, just not appetizing! You're braver than I, Lisette! She ate her oyster, we picked the "one thing we'd buy if we had the money", then we finished our drinks and moved on to the next store. As the night went on, our group grew in size. We visited many stores and tasted many delicious treats and drinks. We had ahi tartare (top photo) and a fruit tart at Cole Haan. The ahi tartate was served with some type of delicious, stinky cheese and avocado, and was incredibly fresh and so yummy! The fruit tart (middle photo) was a beautiful sight with a sweet, creamy base served on a buttery, flaky crust. In Juicy Couture we had some specialty macaroni & cheese (bottom photo) from Apartm3nt (pronounced Apartment 3) that was creamy, rich and decadent! I think there was a little bit of bacon it, which is not cool since it was Friday, during Lent, but once I realized it was too late. I tasted some mushroom, too, and you can probably see the scallions. Juicy also served a gross mixed drink and almost got $30 of mine for some adorable pink leather flats for my Goddaughter. It's probably better that my cousin was sleeping and didn't get back to me with her shoe size until the next day! Toward the end of the evening, we were encouraged to take our stamped passports back to the check-in area to drop them into the raffle for a chance to win a bunch of great stuff from the participating stores. 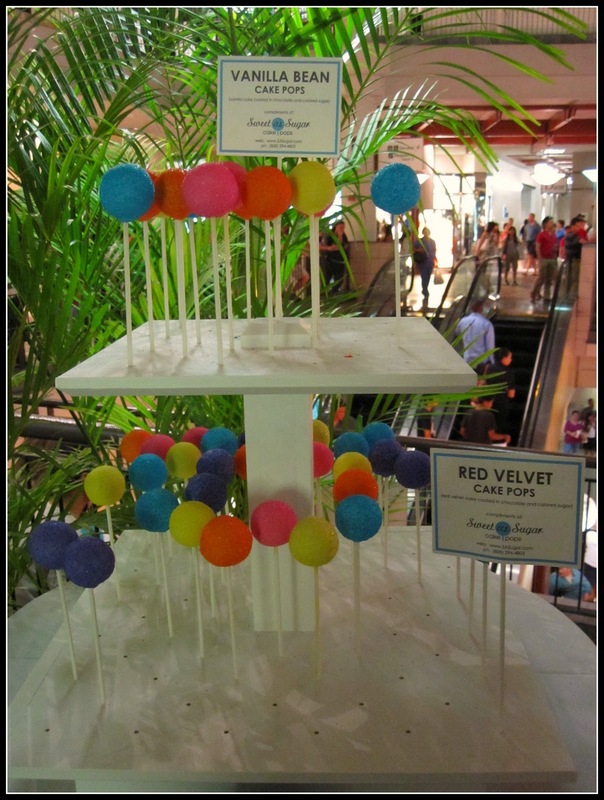 Nobody we know ended up winning, but we did find cake pops! They were so beautifully colored and fun! We each got a cake pop of our own, and posed with them to show off their, and our, cuteness! Some of the girls ate theirs right away, but all agreed that because they were so very sweet that you couldn't bear to eat the whole thing. Mine was red velvet and I saved it for the next day. It was really good, really moist cake surrounded by another sweet substance (chocolate or marshmallow, maybe? ), and rolled in sugar. It was, as the girls mentioned, entirely too sweet to be eaten in one sitting. Once the fuss of the event was over, we were all still hungry and ready for some substantial food. We went to the top floor of the mall where the bars, clubs, and restaurants are located, and enjoyed a late dinner at California Pizza Kitchen. It was casual, relaxed, and perfect after a night of uppity attitudes and tiny bites of food. I had one of my favorites, Pear & Gorgonzola Pizza. The leftover pizza and cake pop made a perfect lunch on Saturday. Overall, the Passport to Luxury event was a blast. I went into stores I'd never been into before and skipped the ones that I typically shop in, it was a totally different experience. We enjoyed the free food and drink, time spent with friends pretending that we could afford the items in the high-end stores, and laughing about it all the while. "What more could you ask for?" It's cool how the event got you to shop in different stores. I think it would have taken an event like this to get me to go into some stores that I otherwise am afraid to go into! I've always wanted to go into the Miu Miu store but I'm scared that if I do I might end up financing something that costs more than my rent!